"All Burned Out CAT Throw" Charles Wysocki was a master at capturing character in cats and in settings. This piece is no exception. 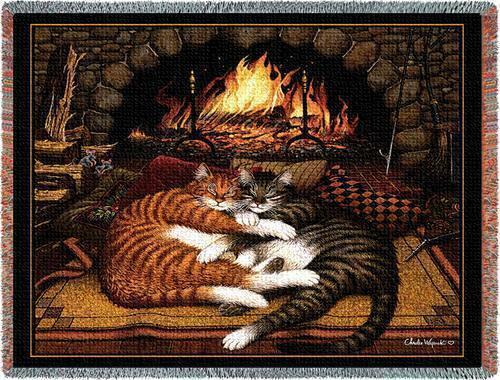 In this image, two striped feline companions are contently napping in front of a roaring fire. This makes the perfect gift for the cat lover! Cotton. Woven on Jacquard looms. Measures 70" Wide x 54" Long. PLEASE NOTE: Shipping ONLY within the continental U.S. **Hawaii, Alaska, and Puerto Rico residents please contact seller for shipping quote before ordering.